Steins;Gate is a remarkable show. Reaction from the aniblogiverse has been uniformly positive, which is not usually the case. From the short and sweet, to more detailed comments, bloggers appreciate the consistent development of the story, the great characters, and the entertaining bits of humor. Episode 15, though tense, was not as dark as recent episodes. As Guardian Enzo points out, this was in part because the Future Lab members are fighting together against the future, and those who will control it. To some extent, this episode was expository, but we had some interesting developments with a possible path (to the past) that might save the future. As time travel shows are likely to do, this situation raised a paradox in my mind: If “John Titor” does travel to the past, and Okabe has to time-leap, does he run the risk of preventing the time machine from having been repaired? Alternatively, might the time-machine’s journey prevent the time-leap machine from having been created? Either way this is the one show that has continued to deliver for those of us following it. Certainly Steins;Gate is a standout example of recent Science Fiction anime. Oooh the engrish made me laugh so hard! I am mad scientist! It so cool LOLOL awesome. Great episode thou nice to see them all working together like you said finally! Yeah, I can sort of feel for Okabe. Once, in Zurich, I tried to order train tickets in German, and the guy said, “Just say it in English”. My favorite joke, though, was Okabe “revealing” his /a/ handle. Hehe, Okabe “revealing” his 2chan name was hilarious, but even the smallest of interactions between the cast (such as the discussion about the rotating flying camera between Christina and Okabe) still manage to be fun. Then there’s Daru hitting on Suzuha. Got to love the main cast here, they’re just great for jokes and stuff, yet I could still take them seriously. lol. Yeah, the various character interactions are quite fun. I loved this show right from the beginning, but, yes, there were people saying it started slow, and even midway through the first season there were people who wanted to skip right past the story and have a functioning time machine. IMO, this would have harmed the show. 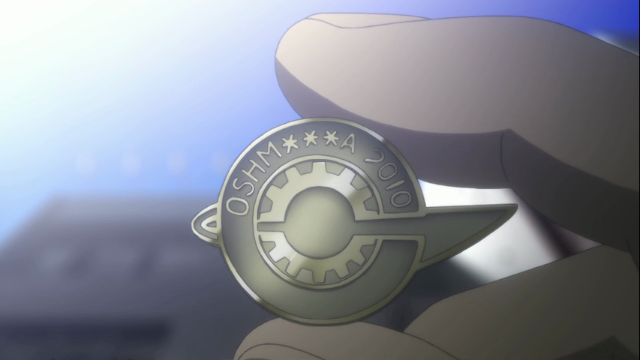 One of the things that make Steins;Gate work is the development of the time-travel capability. This show is great the way it is! it seemed to me that Daru could be Amane’s father, that is, until that phone rang… what do you think? I have seen that theory, but I don’t know what to think about it.